From left-to-right: Richard Moy is a postdoc at Wilamette College in Portland (for previous blog posts on Richard’s work, see Hilbert Modular Forms Part II and Part III), Zili Huang (Thurston and Random Polynomials) has a real job at a consulting firm in Chicago but swung by to say hello on graduation day, Vlad Serban (The Thick Diagonal) has as postdoctoral position in Vienna, and Joel Specter (Hilbert Modular Forms Part II and … hmmm, I guess I didn’t blog about any of his other papers) has just started a postdoc position at Johns Hopkins. Missing are Zoey Guo (Abelian Spiders), now at the Institute of Solid Mechanics at Tsinghua University in Beijing , and my first student Maria Stadnik (who just moved to Florida Atlantic University, and whose thesis predates this blog). It’s easy to get the sense as a student that math departments are fairly static (which is mostly true over the 4 years or so it takes to do a PhD), but as time goes on, people end up moving around much more than you expect, and the characters of various departments change quite a bit. A sign of good hiring is that your faculty leave because they have been recruited elsewhere! 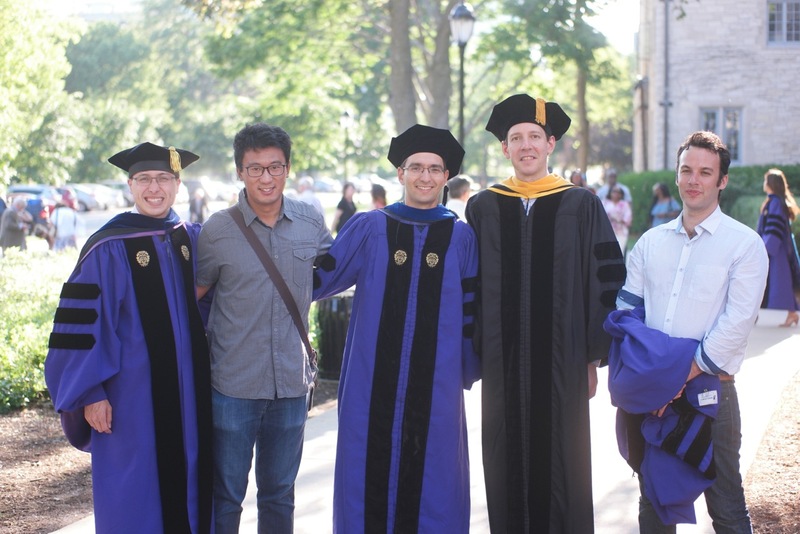 And even though my departure two years ago brought one era of number theory at Northwestern to an end — starting with Matt, then me, two one-year cameo appearances by Toby, and a string of very successful postdocs (not to mention the occasional visitors) — a new era has already begun, with the hiring of Yifeng Liu and Bao Le Hung. This entry was posted in Mathematics and tagged Bao Le Hung, David Savitt, Ellen Eischen, Florian Herzig, Graduation, Joel Specter, Langlands, Maria Stadnik, Matthew Emerton, Northwestern, Patrick Allen, Richard Moy, Simon Marshall, Students, The Hawk, Toby Gee, Vlad Serban, Yifeng Liu, Zili Huang, Zoey Guo. Bookmark the permalink. Great to see Richard Moy there! I knew him from a couple of classes in Urbana and he wrote one of the best projects ever in my undergraduate research seminar.